Ok. So this isn't exactly an Aperture tip. 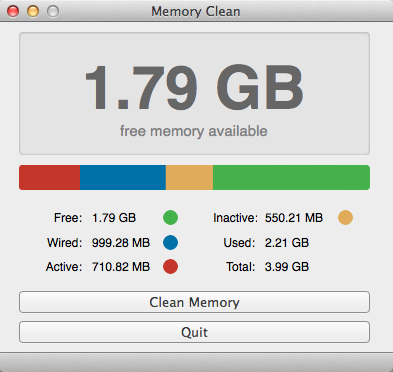 But I happened across a very cool utility in the Mac App Store today called Memory Clean. It's a nifty utility to quickly free up memory. Simple, clean interface. And for the time being, Memory Clean is free! If you're like me, you'll close out many applications before launching into an Aperture working session. Instead of waiting for Mac OS to reclaim and free up memory, now I'll run Memory Clean just before launching Aperture. An example on my 4GB Mac Book Pro just after closing out Safari. The delta was even more pronounced on my 10G Mac Pro where I had a lot more "app-thrash" over the course of a working day (roughly 2.5G memory reclaimed).